If you have been following the GT Bicycles crew over the past three years now, you have seen a lot of progress. They’ve completely revamped their team, the product line has gotten a ton better and they’ve been far more actively supporting BMX like they had back in the day. A big part of that reason is Ben Ward‘s role in product design and managing the BMX program for GT, and seeing his ideas coming to life are pretty wild. A little while back, GT released their classic Pool tire with a crazy sidewall that used their Junk Food design that was found on one of their Pivotal seats. We have seen BMX tires come in a lot of different colors, sizes and patterns, but we didn’t expect to see graphics like that on the sidewall. We decided to hit up Ben to learn a little bit more about the story behind the Junk Food Pool Tire… Let’s do this! Alright, Ben! Let’s get into this. The Junk Food Pool Tires have been finally released and seem to be getting a good response. When did you originally start working on this concept for the tire? We started working on this concept just over two years ago. What were some of the reasons it took so long to go from concept to final product? Were there any crazy hurdles you had to jump to make this happen? First was the idea and figuring out how to pull it off. Then a few rounds of samples, mainly to get the colors to pop and match the textile versions of the Junk Food pattern as close as possible. The last bit of time was rebuilding our customer base on the sales side to make sure we had people to sell the tires to. We’ve gotten some great traction there, so I hope to keep rolling out new goodies for everyone. What made you want to go with the Junk Food design? Were there any other options that you guys had considered when ideas for this started flying? Nope, no other ideas. Truth is, I wanted to jump the shark with a print design. Something so out there you couldn’t take the silliness any further. That idea just ended up turning out rad and people are stoked on it, haha. Hat’s off the Chris Piascik for turning my silliness into something cool. Is there a possibility that you be doing any other designs in the future or is this kind of a limited run you wanted to try out? Everything has gone so well with the idea development and now that it will finally be under riders, I can see how it does with the masses. I want to keep working on new designs. But that is down the road, people are just now getting a taste of this. Since we know somebody will ask… How are they for grinds? Does the sidewall help slide better or is it slightly sticky? Does the print hold up to wear and tear well? Both our LP-5 and Pool tires have Quick Release smooth sidewalls for grinds and you shouldn’t feel any difference between the Junk Food wall or a black wall Pool tire. As you ride, the graphics will smudge like any color sidewall. What sizes do the Junk Food Pool tires come in and what are they retailing for? The Junk Food Pool tire is a large 2.3” (measures 2.37” inflated) and retails for $24.99. That’s a bit higher than a standard Pool tire, but still competitively priced for such a unique offering. We had a lot of the old school guys asking if the tire was going to come in smaller sizes? Any chance you’ll do a limited edition run of smaller 1.95” or smaller tires for the collectors out there? We do have molds for the Pool tire in a 1.95”. The sales on it completely fell off, so we haven’t brought any more back in. Noted on the request for the future. For the Old School heads, we have the LP-5 (Logo) tire in a 2.2”. It is true to size and I think they will love it for both the size and nostalgic look. Do you think we’ll be seeing more brands picking up this unique tire option in the future? The possibilities seem pretty endless. Unfortunately, an original idea doesn’t stay original for too long in BMX, so I wouldn’t be surprised if some other brands figure out how we pulled the concept off and do their own versions. Saddle and tires have become the apparel part of the bike, so I really want to see where we can go with ideas to help the rider’s dress their bikes as unique as they dress themselves every day. Of course, for the white T and blue denim crowd we still make things in standard Black. Since we know you recently spent some time over in Taiwan… Any hints at what’s to come for GT in 2018? We have seen a lot of comments of people talking about how products aren’t as creative and unique as they used to be. 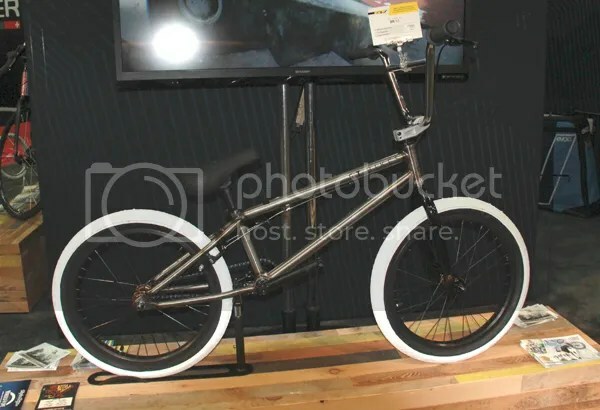 Where do you see BMX products going in the coming year or two? Do you think we’ll start seeing more creative and unique designs start popping up again? If those two keyboard vocal people could buy enough product to keep brands doors open, you would still see creative and unique offerings. The thing is, those products existed and the tide turned. Pockets have gotten leaner and no one wants to take a chance on purchasing new ideas. Tried and true is the current path. If it ain’t broke, don’t fix it. There isn’t enough money in BMX to justify reinventing the wheel when the current wheels are infinitely better than anything before them. I am not going to comment on where I see things going, but what I would like to see is more people putting the phones down, closing the laptop, getting away from the desk to go outside and ride, like I should be doing. Thanks! If you aren’t feeling the Junk Food Pool Tire, the tire also comes in a pretty wild Black that slowly turns yellow as it wears down. If that’s a little too wild for you, you can pick it up in Black, Brown and red. Here’s a look at the Junk Food Pivotal Seat that matches the tires as well. Just incase you missed that one when it came out awhile back! Here’s another sneak peek GT Bicycles‘ Brand Manager, Ben Ward, dropped on something he is working on! It looks like their Pool tire will be getting some color in the near future including a “sweet” one we haven’t seen from other brands yet! Above is a photo of the Pool tire in red Clay, Chocolate brown and Earl grey! No word on the set release, but if Ben is sharing the photo it has to be getting close!